Our family went for a scary walk the other day. It didn’t start out scary. It was a pretty stroll along a wooded path and past a hidden pond, gurgling streams, and maples in the last flush of fall foliage. When we returned to the house, glowing with good health, we tallied up our sightings. Then someone mentioned ticks. You can guess what happened next: A frantic search of humans and dogs. And, yes, we found ticks, dozens of them, perched on the napes of necks, crawling up the insides of pants legs, nestled in human hair and canine fur. Time to call 911? After all ticks may transmit a rogue’s gallery of maladies, from Rocky Mountain Spotted Fever to tularemia, whose operative organism is considered a potential bioterrorism agent. But our tiny hitchhikers were easily removed—they hadn’t yet burrowed in for a blood meal. And their size identified them as common dog ticks which are not usually particularly dangerous, though they can carry some nasty diseases. Had they been much smaller—say the size of a sesame seed—they might have been female deer ticks, vectors for the dreaded Lyme Disease. And that would have been scary. Ticks are not true insects. They’re arachnids, related to spiders. Like spiders they have eight legs—and they’re creepy. They’re an ancient life form, originating perhaps 400 million years ago. About 900 species inhabit the world, including 90 in the continental U.S. Temperature is no barrier to their distribution; they can be found on every continent, even in Antarctica where they infest seals, penguins, and sea birds. And ticks are prolific breeders. A healthy female can produce thousands of eggs at a time. Bottom line: ticks are a highly successful life form and deserve our admiration. Okay, admiration may be a stretch. You’re probably thinking repugnance. And they do seem repugnant. It comes down to their diet. Female ticks subsist solely on animal blood, and their dining habits are abhorrent. They’ll perch on a leaf or blade of grass and wait for their meal. They don’t jump, like fleas. They simply climb aboard a suitable host and seek out bare skin where they latch on, scissor out an opening, insert a feeding appendage, and start slurping. Ticks pass through three life history stages—pinhead-sized larva, nymph, and adult—and the females of each stage need blood meals to survive. They can feed for days at a time and their host may not even be aware of them. It’s bad enough to have a blood-sucking bug embedded in your skin, but that’s not the worst of it. 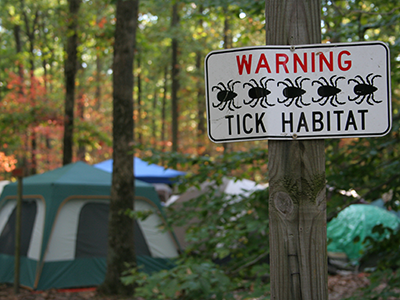 Feeding ticks are notorious for transmitting germs, from viruses to bacteria to parasites. When the pathogens infect the host the results can be debilitating or even deadly—some scientists believe that ticks may have contributed to the demise of dinosaurs. The tick’s saliva transfers the microbes to the host’s blood. For Lyme Disease, vectored by the black-legged, or deer tick, the culprit is a corkscrew-shaped spirochete bacterium. The bacteria travel throughout the host’s body in the bloodstream, often lodging in areas that the host’s natural antibodies—or antibiotics—have difficulty reaching. If the victim is fortunate, a tell-tale “bulls-eye” rash will appear at the bite site, along with flu-like symptoms, and the individual will seek medical attention. But antibiotics, even if administered soon after the bite, may not be effective. And a rash may not be apparent and symptoms, in the form of arthritis-like pain, chronic neurological distress, and/or cognitive impairment, may not show up for years. •Location, location, location. Try to avoid prime tick habitats like high grass, brushy areas, and leaf litter. Stick to the center of trails. •Dress for the occasion. Tuck pants cuffs into socks, wear long-sleeved shirts and a hat, and cover exposed skin. •Repel boarders. Use a repellent, preferably containing at least 20 percent DEET (follow product instructions!). Consider treating clothing and gear with permethrin, or buy pre-treated products. •Check, please. Thoroughly inspect yourself after each excursion (including nether regions). Mirrors help. Don’t be shy about enlisting the aid of a significant other. And don’t forget your gear—and pets. If you find an embedded tick, clasp it with tweezers as close to the skin as possible and gently remove it without crushing. Then thoroughly cleanse the area with soap and water. •A clean bill of health. Shower as soon as possible and check yourself again in the process. Throw dry clothes in the dryer, set on high heat, and tumble dry for at least ten minutes. So take precautions, use common sense, and head on out! 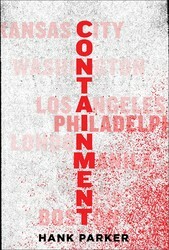 From a former US government advisor on agroterrorism comes a ripped-from-the-headlines debut thriller about a global plot to release a deadly virus and the elite response team who must try to stop it.When a gruesome new tick-borne virus breaks out near a major US city and the outbreak is traced to an extremist group in Southeast Asia, the race to stop a global bioterrorism conspiracy is on. Government epidemiologist Mariah Rossi must leave the safety of her lab to help fellow scientist and covert CIA agent Curt Kennedy track the disease back to its source. Their worldwide net leads them to an underground lab in the jungles of the Philippines, then to a deadly and climactic battle in coral reefs near Malaysian Borneo, and finally to London and back to America, where the virus must be contained. For fans of Michael Crichton and Richard Preston, this chilling, realistic thriller is a terrifying reminder of how vulnerable humans are to biological threats—and in this instance, just one tick bite away from catastrophe.